Redacting a PDF file allows you to hide sensitive information while otherwise keeping your document's formatting. 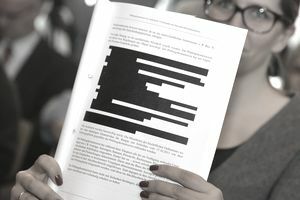 Redaction can and should be used to cover private information, such as Social Security Numbers, competitive information, and even images. In a properly redacted file, formatting elements remain unchanged, while classified information appears as a black box. Doing this is not as easy as highlighting the text, changing the highlight color to match the font color, and watching everything disappear. While that approach makes it look like the document has been redacted, the text remains in the document. Most people with a basic understanding of word processing can copy the "redacted" information, paste it into a text file, and view the classified information in all its naked glory. Adobe's Acrobat Pro software offers easy-to-use tools to redact a PDF, but note that this is not the free version of the software. As of 2019, the most current version of the software is Adobe's Document Cloud version, known as Adobe Acrobat DC. Follow the steps outlined to properly and securely redact a PDF in that version of the software. This process does not simply cover sensitive information with a black bar. It removes the content entirely. Convert your document to Adobe PDF format. If your document is not already in PDF format, there are several ways to change it, depending on your word processor. Open Office, for instance, puts a button in the taskbar that lets you export your document to PDF format with two clicks. Microsoft Word allows you to "save as" a PDF file. You also can download various print drivers and file converters that will bring you the same functionality. Open your document in Adobe Acrobat Pro. Keep a copy of the original, nonredacted document in its original format. It's a good idea to save a copy and rename it before redacting anything so you don't accidentally destroy your original document. Select the Mark for Redaction tool from the Redaction Toolbar. A dialog box will remind you that your redactions will become permanent once the document is saved. Highlight the text or images that you wish to redact by holding down your Control key and dragging the cursor. The Mark for Redaction tool also will give you an option to redact an entire page or page range. Once the text or graphic has been covered, you also will double-click on the redacted area to add a sticky note. Select Apply Redactions from the Redaction Toolbar. Again, a dialog box will remind you that these changes will become permanent once your document has been saved. Add an "r" or some other indication to the redacted version's file name.